In 12 Bit Alchemy (2017) the Berlin based studio Waltz Binaire deals with the ongoing transformation and evolution of digital matter. The goal of this work is to explore new shapes and color in digital chain reactions. 12 Bit Alchemy is specifically developed for the exhibition Prima Materia, and is the first public presentation of this experimental approach by Waltz Binaire, combining real-time coding of video and rendered computer graphics. 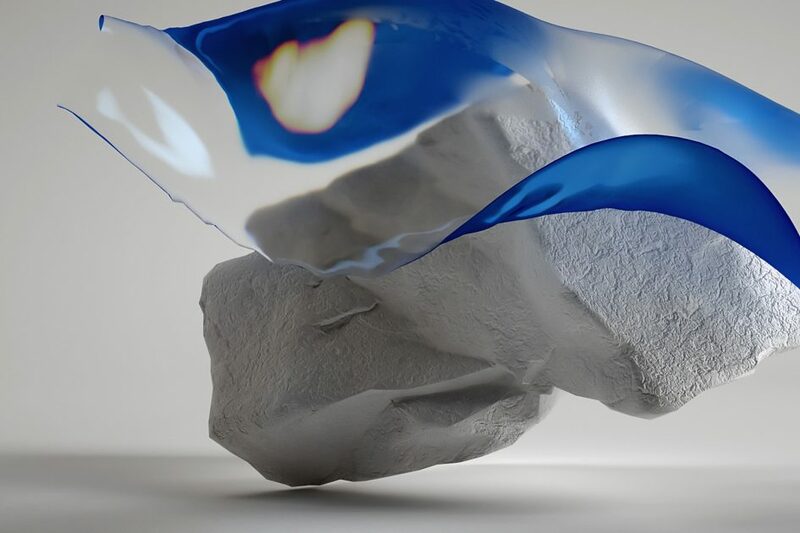 As true digital alchemists, Waltz Binaire combines digital shaders with different physical properties to generate unknown and experimental physical attributes in digital material. Processing these digital building blocks in this way breaks with known coding behaviours. It generates new physical behaviours in digital material. To tinker with code and combine rendered materials and real time generated video, to create new shapes and materials, is the alchemy of this video installation. Through the poetic collision of human desire and cutting-edge technology, Waltz Binaire illustrate the voltaic friction between the present age and digital harmony. Exploring the aesthetics of this encounter is the journey of Waltz Binaire. They envision, design and implement new artistic perspectives towards human identity and innovative technology. To enrich the perception of digital phenomena and to communicate new ideas, is why they moonwalk on motherboards.